Give your beans that back-burner, slow-simmered flavor without the long wait! Heat a large saucepan over medium-high heat. Cook bacon until crisp, about 5 minutes. Drain bacon on paper towels reserving 1 Tbsp. bacon grease; crumble and set aside. Cook onion in bacon grease over medium-high heat in same pan 3 to 4 minutes or until edges are browned. Add beans, sugar and bacon. Bring to a boil, reduce heat to medium-low and simmer, uncovered, 5 minutes to thicken sauce slightly. Season to taste with salt and pepper, if desired. Southern-Style Green Beans with Sausage - Substitute 2 oz. diced smoked sausage for bacon in Step 1 and use 1 Tbsp. vegetable oil instead of bacon grease in Step 2. 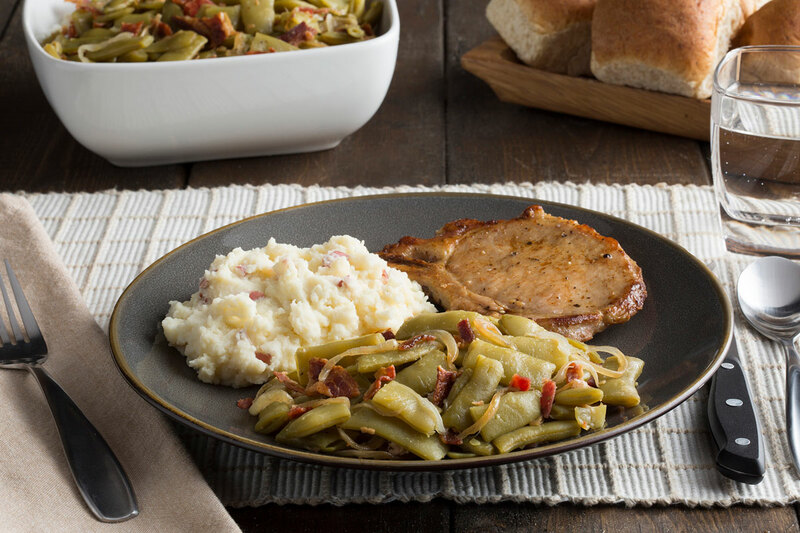 Southern-Style Green Beans with Potatoes - Add 1 can (14.5 oz.) Del Monte® Diced New Potatoes, drained, with the beans in Step 2.